Thousands at the Ohio Statehouse Rally to Save Our Pensions! A massive crowd, estimated at over 15,000, descended on the Ohio Statehouse July 12, in Columbus, demanding that a rapidly growing crisis in our nation’s pension system be fixed. A sea of camo shirts and caps, worn by miners, filled the open area in front of the statehouse while chants of “Fix It” echoed off the surrounding buildings, as the “Rally to Save Our Pensions” kicked off. Thousands of blue-shirted Teamster retirees, victims of huge pension cuts, filled out the crowd. Union singer Mike Pomeroy, from West Virginia, had demonstrators singing lines from a Woody Guthrie song: “This land was made for you and me,” they sang. It became clear, however, that ‘this land,’ as now constructed, belongs to billionaires, something this crowd intended to change. Fluharty was referring to the massive labor-led referendum in 2011 that overturned a Republican effort to force a “right-to-work,” anti-labor bill onto Ohio’s workers. This rally, like the huge Issue 2 fight, showed a myriad of colors - including purple SEIU shirts and red CWA colors. Steelworkers were in blue while building trade groups, wearing their hard hats, were outfitted in work gear. 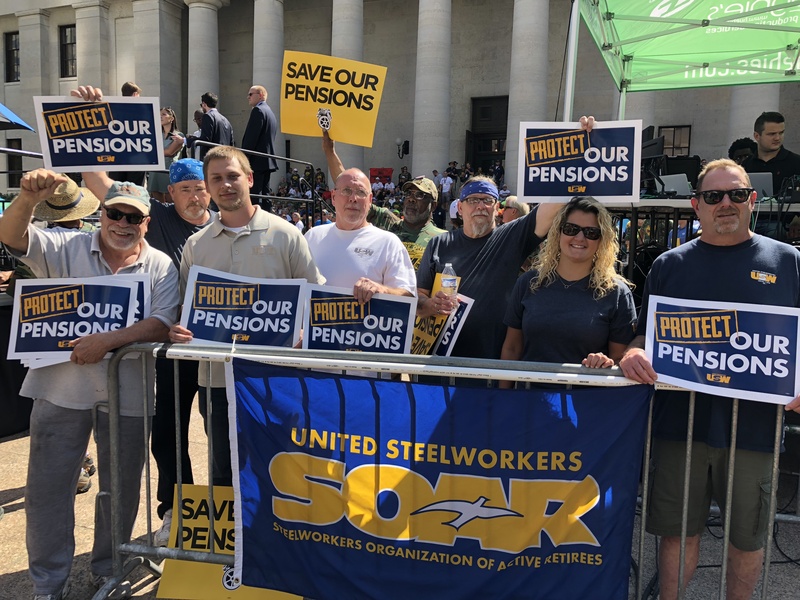 The rally was called to coincide with a field hearing the following day by the Senate Joint Select Committee on Solvency of Multiemployer Plans, of which both Ohio’s U.S. Senators, Sherrod Brown (D) and Rob Portman (R), are members. That committee was created by the Senate to attempt to reach consensus on a plan to save workers’ pensions from multiemployer plans. A massive, and growing, crisis has developed over the past decade, as large numbers of multiemployer pension plans saw a wave of bankruptcies and failures after the housing crisis hit. The crisis was made far worse by the GOP majority in Congress in 2014, when they passed the Multiemployer Pension Reform Act, (MEPA) allowing, for the first time, cuts in pension plans taken over by the Pension Benefit Guarantee Corporation, the government agency set up to take over failing pension plans, and distribute funds to pensioners. Some retirees saw their pensions cut down to $150-200 per month. Worse still, their healthcare was also taken away. The field hearing will deal with pension plans covering 1.5 million Americans, over 60,000 from Ohio. “This is shameful, immoral,” said Ohio State Representative, Hearcel Craig. “Government is supposed to help people, not legislate to destroy their families. It has become government by and for the billionaires, while they break contracts with our people!” Hearcel, who has represented District 26 of the Ohio State House since 2015, is the Democratic candidate for District 15 of the Ohio State Senate. A large pension rights movement, led by rank and file retirees and workers, is spreading across the nation in response to the pension cuts. “It isn’t just retirees themselves and their families who are hurt by these cuts,” according to Norm Wernet, president of Ohio Alliance for Retired Americans. There were huge cheers when Ohio U.S. Senator Sherrod Brown’s name was mentioned from the stage. Sherrod has introduced legislation, the Butch Lewis Act, to raise federal monies to be used to strengthen funding of the PBGC, which holds the failed plans, and to protect the multiemployer plans. The bill, if enacted, would create a low-interest 30-year federal loan to troubled pension plans, with no cuts to retiree’s benefits; however, it failed to get bipartisan support. As with all economic issues, GOP proposals to address the issue put the entire burden on retirees, proposing even further pension cuts. “When you won’t stand up for something, Martin Luther King told us that we’d lay down for anything. Those great powers that be,” UMWA President Cecil Roberts told the fired-up crowd, “told us, when we faced far harsher conditions, ‘You can’t win!’ So, we organized and we fought! We won our union! They told us when we all joined together to fight for civil rights, ‘You can’t win, give up!’ So we organized and we fought, united, and we won! Always, the powers tell us that we can’t win, that we shouldn’t organize, we shouldn’t fight. However, we organized, we fought, and we won because we stood together united! We’re organized, we’re fighting, and we are going to win! USW Rapid Response and SOAR are keeping up the efforts to protect retirement security. Click here to learn learn more about the USW’s Protect Our Pensions Campaign.